OK, not the best picture, but at least the cute canine comes in loud and clear. 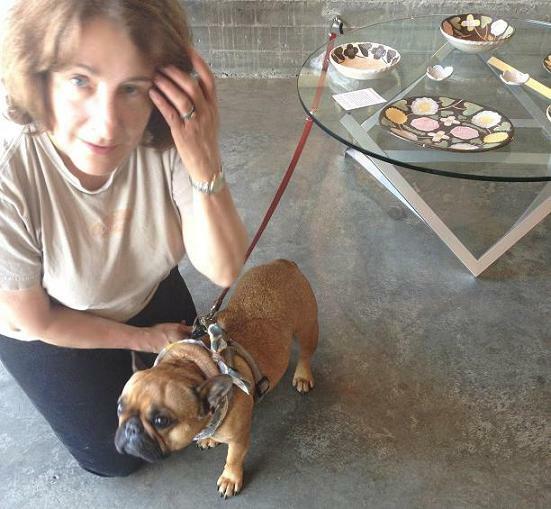 Meet Fellini, the proprietress at Chariots on Fire, one of the hip shops on the LA street named the coolest by GQ mag. A moment to savor after a hectic short visit, rudely interrupted even before it began, when the ride got really rough, and drivers all around us started trying to get our attention. Duh. Our rental had a flat. What to do if this happens to you, when I return. In transit back to East Coast. This entry was posted in Let's Paws: I break for critters and tagged Abbot Kinney Boulevard, dogs, French bulldogs, rental car problems, traavel, Venice California. Bookmark the permalink.